Are you aware of the upcoming new EU legislation, General Data Protection Regulation (GDPR)? All websites need to be compliant with this new legislation, any website collecting any personal data must have a compliant privacy statement, cookie statement, and a cookie banner. This new legislation has increased the information that is currently required, under the Data Protection Acts, to be supplied to web users through the privacy statement on the website. Also, there are changes regarding obtaining web users consent when using certain cookies on your website. 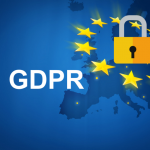 GDPR is probably the biggest change in privacy law in over 20 years and there are significant fines for non-compliance. For more detailed information on GDPR please visit: dataprotection.ie/docs/GDPR/1623. With regard to adding this to your website all you need to do is add a “privacy statement” page first and then install a cookie statement plugin (press on the links in blue). I have installed a cookie statement plugin on this website (you will see it at the bottom of the page) and it is linked to my privacy statement (you can use my statement copy if you wish but do change name and contact number). The plugin I used on this website is called “Cookie Notice By dFactory“ and this plug-in is free and very easy to use. Just go onto “Plugins” and “Add New”. Once you activated the plugin you will see it under “Settings” in the WordPress Dashboard and you can then link it to your new page for privacy statement . If you want me to add a privacy statement, cookie plugin, and update all the website software please email me at info@webdesignerwicklow.com or call Sheena at 086 8683920.